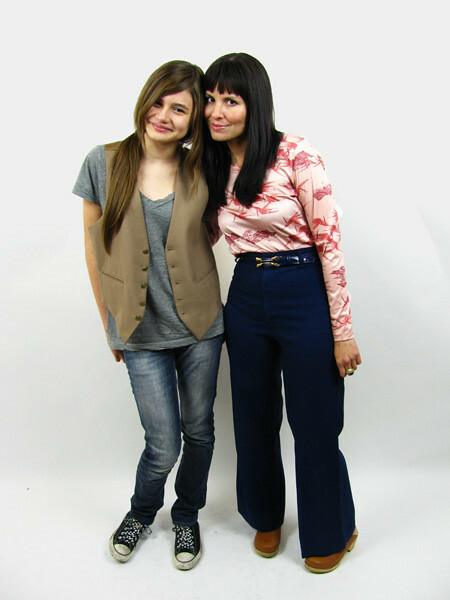 Today's vintage lovin' and wearin' mama is Gisela Diaz the curator of Bella Vintage. I have had the opportunity to meet Gisela and let me tell you... she is one cool mama! She doesn't even look like a mama at all! Her and her daughter Zoe look more like sisters!!! A: i started wearing vintage when i was 14. i was in 9th and just starting highschool in 1992. at the time the grunge movement was the trend and in my school if you were not wearing flannels and oversized pants vintage was the dress of choice. baby doll dresses were all the rage and vintage ones were my favorite. i walked into my first thrift store that year and it was love at first sight! A: the first thing that immediately catches my eye is the fabrication and/or print. then i feel the hand of the fabric and look at construction. back when i was a teen i would were stiff poly pants, shirts, dresses because it had the coolest prints you can't find in retail. now the hand of the garment pretty much determines if i will buy it or not. A: ahh i have a few. i'll have to say it's a tie between a 70's 2 piece matching skirt and top designed by Halston which i have yet to wear! and a floral 80's Valentino dress, just beautifully constructed which has also been hanging in my closet for a few years! A: way too many! i would say one that comes to mind was a beautiful 1960's slip dress from Christian Dior which was a mere $100 but for a single mom on a tight budget, at that time it was to much for me to part with that money. A: well i LOVED the days when i could style Zoe with my crazy mix of prints of vintage / or vintage inspired clothes between birth and 5. now that she's older she's more of a laid back rock/surf type california girl. but she is dying to find two vintage items which we are still searching for; a really well fitted motorcyle jacket and a sailors hat like the one Blondie wore in the 70's. but in these pictures she brought in her personality and style and mixed it with a vintage item. in this case my mom's original 80's western snap button jean top & a 1960's mens vest. shops i love to surf just to look at all the pretty things are adore vintage, mama stone vintage and bustown modern vintage on ebay. and as far as thrifting goes, my favorite place i love to thrift is my home town of Miami. a lot of retiree's with a lot of great vintage! Thank you so much Gisela! You have such a keen sense of style and it is no doubt that Zoe is going be just as fabulous!!! If you are a vintage lovin' mama or have one you would like to see featured, leave us a link here! We love learning from and getting inspired from other mamas who like to give life to old things! And check back tonight as Rachel and I will be sharing what vintage the boys, in my case boy, in our lives like to wear! Thanks for sharing the other links also. I’m always on the lookout! they do look like sisters!!! Gorgeous! What an awesome mother/daughter team. they are both beautiful! gorgeous style. I hope when my daughters that age people mistake us for sisters as well!!! :) Love the high waist navy blue pants!! I'm not really a dress person so vintage pants are always a good find! Ah she is so adorable! I hope I can hone my own style into something this perfect. Gisela's style is amazing! And I think that she looks more like a sister than a momma. And she is just so nice!